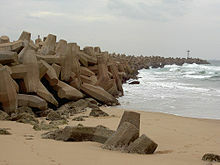 Breakwaters are structures built to protect structures along a coastline against the impact of waves. They reduce the intensity of waves, and lessen the amount of erosion. This page was last changed on 17 January 2016, at 07:57.